Every car has an outer layer of clear coating that seals and protects its paint. Time and friction will eventually cause damage to this outer clear layer, no matter how well you take care of your car. Paint correction, also called paint restoration, works by removing microscopic layers of your car’s clear outer layer to take care of imperfections. By removing scratches and swirls on this outer layer, your vehicle is left looking like new, with its original paint fully intact. Clay bar treatment is used to remove contaminants that pollute and slowly destroy your paint. These contaminants cannot be removed by washing alone and include things like brake dust, rail dust, and industrial fallout. 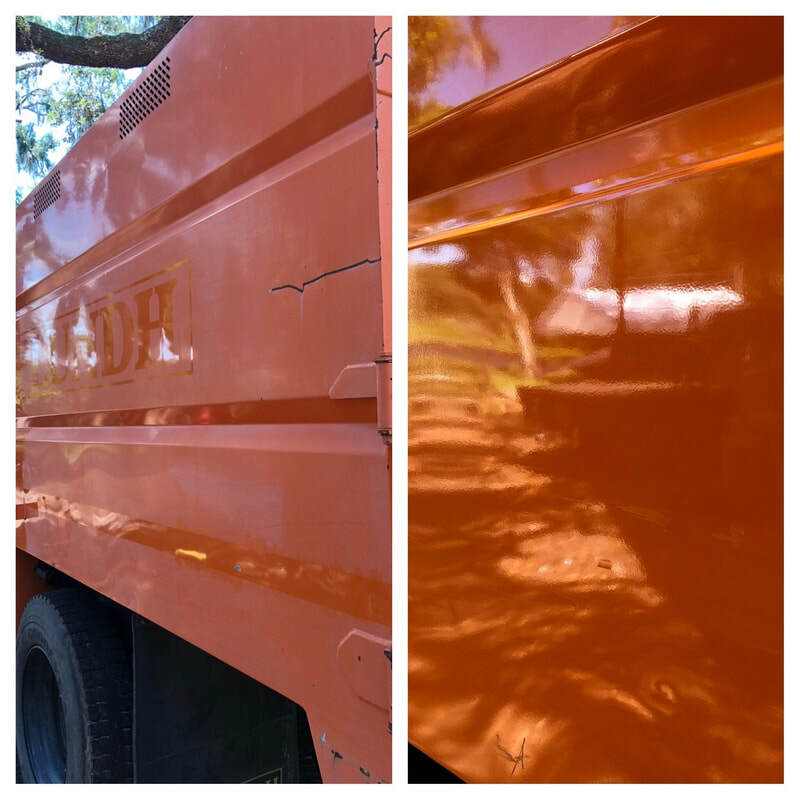 The next step is to remove iron fallout that has embedded into the paint, which left untreated will create rust spots. This chemical process opens up the pores of the paint, dissolve the remaining contaminant, and release it. Paint is properly compounded and polished to bring back that like-new or better-than-new finish. This step is what produces gloss, clarity, and shine. It is important to lock in the results with a wax, sealant, or ceramic coating. This is the economy package that gives your car that "new car shine". We thoroughly wash the vehicle, clay the paint, then perform a quick polish to enhance clarity and gloss. Some light swirls might be removed with this package, but this is not paint correction. After polishing we apply a hand wax to protect the paint and keep it looking glossy. Paint Correction is a delicate process so we must see your vehicle for a test spot to determine which stage will work best for your vehicle. Stage 1 is a light polish that generally removes 80-95% of swirls. This package is great for vehicles that get hand washed carefully and will not remove scratches caused by tree branches and other heavy scratching. After polishing we hand apply a super-hydrophobic ceramic coating that lasts up to 2 years. When your vehicle has medium to heavy swirls in the paint this package will restore the finish to near perfection. We start with a decontamination wash to prepare the surface for polishing. To remove light scratches and swirls we use a light cutting compound to level the paint followed by a fine polish to perfect the finish and maximize the gloss. We hand apply a super-hydrophobic ceramic coating that lasts up to 2 years. This is an intensive package designed to restore the condition of your vehicle to better-than-new. Vehicle with heavy scratches and swirls many times require this package to get the best results. We start with a decontamination wash to prepare the surface for polishing. To cut out the heavy scratches we use a heavy cutting compound. we then follow with a light compound and a fine polish to perfect the finish and maximize the gloss. With Stage 3 Paint Correction we top the paint with a super-hydrophobic ceramic coating that lasts up to 2 years.